Total People Residing on Hill : 4388 People Resides. Discovered and ventured : Since, 1850. Best time to visit : Monsoon, Pre-Monsoon (Winter). Temperature : Pleasant during monsoon and winter (15 to 20 Degree) and Little humid in summer (Up to 30 Degrees). Known for : Tourist Destination and Picnic spot for summer and monsoon (Hill Station), Eco-friendly climate, Toy trains. Total Hotel Rooms : More than 1000 Hotel Rooms are available during tourist season. Nearest Station in Mumbai : Neral (Matheran is 21 kms from Neral). Distance from Mumbai : 80 to 90 Kilometres, See Mumbai Matheran Road Distance for more details. This Adventure is closed. The new zip line adventure sport started in May 2012, which is a peak summer season at Matheran. More details at Mountain Zip Line at Matheran. Zip Line Adventure is No More available. I did some horse riding recently in November 2017 and also previously in May 2012 and it was fun. Sight seeing walk on horse is what usually is preferred as the pathway is muddy with stones etc. A small round in market area is also fun which many enjoys. If you want a solo fast round, Horse owner will take you to ‘Matheran’s Olympia race course’ made specially for fast horse riding. Trust me, a little dare as first timer or a experience rider, it is really fun riding those horse powers in a chilling winters at this hill station. Horse riding is equally risky and one with heavy body should ignore and rather enjoy a safer journey which is what i recommend as many falling and accidents has been observed in past, specially of overweight people. If you are coming in your private vehicle, You are allowed till Dasturi car parking which is about 3 to 4 Km on hills from Neral railway station. The road ride and turns are extreme and very steep. Only experience drivers should be on driving seats. For safety, put your AC off and ride on first gear only. A small example of how narrow the roads are and how the ride is, below is a small video. Nearest railway station : Neral on central railway route. Via private vehicle : Your vehicle is allowed till Dasturi Naka car parking area. so park and start walking towards hill station (Half Hour to 45 minutes walk) Or alternately take Toy train (see schedule first) that starts from Aman Lodge station which is at walking distance from car parking area. Another option is to take a hand cart which has capacity of one adult & a kid only with luggage. 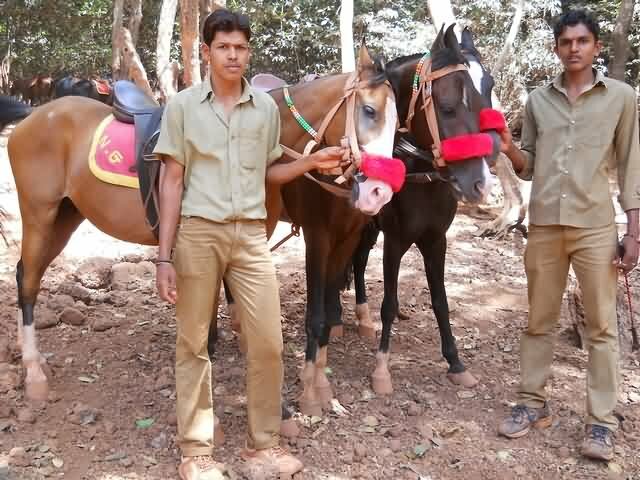 For horse ride lovers, Riding from Dasturi to Matheran station is fun too. 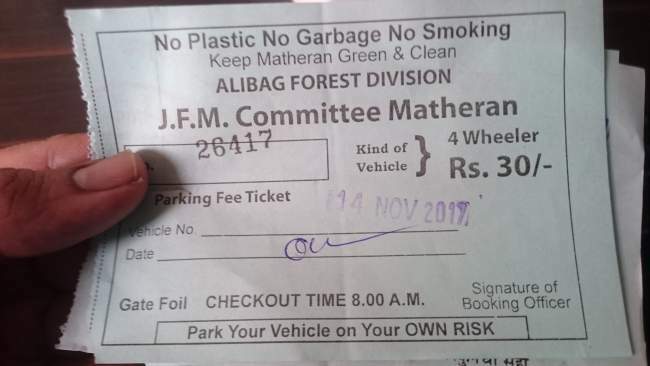 I recently went to Matheran in November 2017 and below are the costing i found. Luggage carrier : Authorized locals help carry your luggage costing Rs.350 to 400 for about 3 bags which one person can carry. Hand Carts : Rs.550 per hand cart which has carrying capacity of One Adult with Kid and 2 small luggage bags. Horse Ride : Rs.550 per horse (Without Luggage). Via Local trains : Nearest railway station is Neral on Central Railway Route. Regular trains from CST, Dadar (Western Route Connection) do stop here. Once here, Take the toy train, Or take the vehicle (share taxi kind) that will take you up hill till Dasturi Naka and from there, take Toy train, Horse Ride or Hand Cart. Since Toy trains do not run till Neral station currently (As of 2017) one needs to take share rental cars till Dasturi Naka. This car rentals charge about Rs.80 per person. From Dasturi naka take the option you love as detailed on above section (Via Road Private Vehicle). Parking fees of Rs.30 per day and extra charge of Rs.50 as some kind of Municipal tax is been charged here. It is a open parking under tree shades. I will highly recommend to take your car cover as their is huge monkey menace. Since i forgot to cover, Upon coming back on next day to this parking area i found my car door and roof muddy. Monkeys try hard to open car doors and peep inside for some food. Thank god i used black sun shades from inside on all four sides. But handles and roof was muddle with hand prints of try opening the car (Yes, it was just monkeys, Otherwise the car parking is safe). By road, as you starts the hills at entry gate (Matheran Taxi Stand), the distance to Dasturi naka car parking is 6.7 Km taking about 10 minutes of real tough hilly road ride. The road are zig zag and climb turnings are very steep. Do not every think of using AC while on this path, But the car climbs smoothly on Gear 1 only. 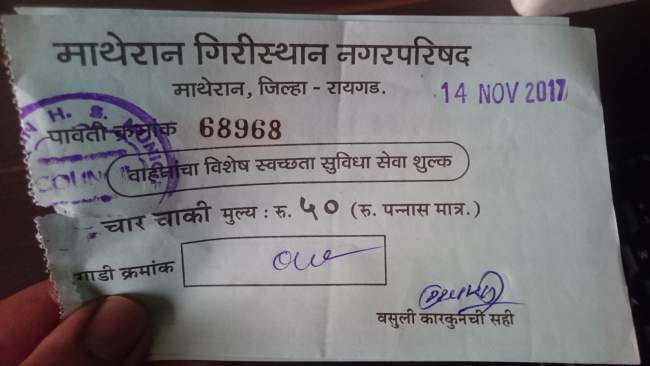 Rs.30 per day for car parking and an extra Rs.50 as Matheran Municipal Tax. Parking exit / checkout timings are morning 8:00 AM which is very impractical and a way to extend charges for another day as no one checkout from any Hotel before 9:00 to 9:30 in morning. So practically one needs to pay Rs.110 for a day parking at Dasturi car parking. The break down is as follows. In December 2012, meeting was held by Matheran Authorities and MTDC (Maharashtra Tourism Development Corporation) to save the eco-friendly hill station and they have come up with a de-congestion plan. If got through, no private/public vehicle will be allowed to be parked at Dasturi naka and parking are likely to be shifted 100% at Neral station location. Only new Eco-Friendly buses will be allowed to go till top and only those who have booked hotel rooms will be allowed till Dasturi. The move is to save the heritage hill from de-congestion and pollution as much possible. Lets see how things get implemented at their best. If you are a first timer to Matheran hills, You must try this toy train ride at least once while climbing or while returning back. Just take note of the shuttle train timings which runs between Aman Lodge near Dasturi naka and Matheran station on top. Refer Timetable and Fare chart to plan better. This train was not running since last 1 year for some technical reasons, But Since 1st November 2017 it has been started its services and is gaining its popularity back. The only sad side of this toy train is that it is not running till Neral station, Which is expected in first quarter or mid of 2018. 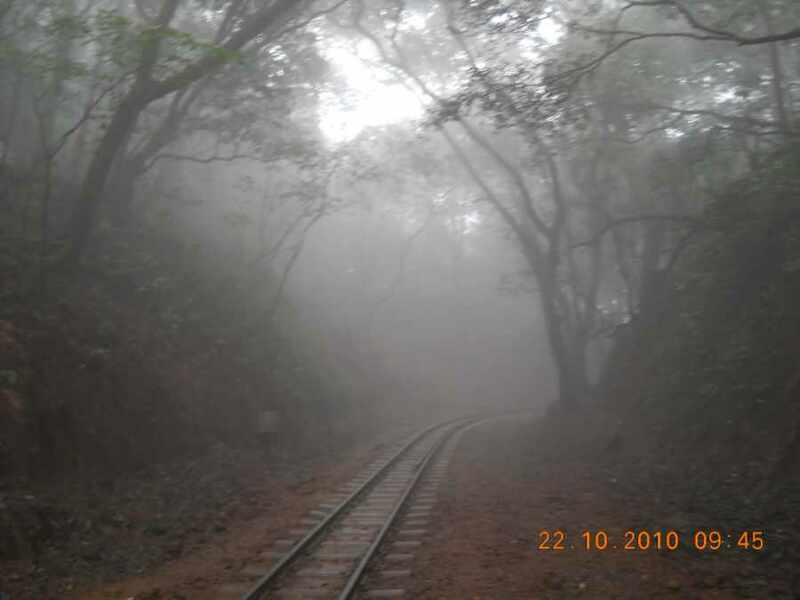 The ride between Dasturi Naka and Neral station is very beautiful as one sees the seep open valley of Matheran between this location. Still for first timers it is a limited fun ride of 25 minutes. See Also : Upcoming Longest Ropeway, S T Bus Timings From Karjat and Mahabaleshwar Hill Station Attractions. To be practical and straight, the sightseeing points which are listed all over including the map at various locations near station & market area up on hills are one time watch. Those who come frequently to this hill station prefers to stay back in their respected Hotel & Resort and enjoy the Serenity, Relax and spend some silent time out far from Hustle Bustle of Mumbai city. I Would recommend take a horse ride for 4, 7 or 12 Points (See Below) and check yourself. It is sure fascinating for first time visitors to see deep valley and visit dam. The actual fun is the ride through the woods i must say. Horse ride charges during off season comes down to Rs.300 for 4 to 6 points and Rs.450 for 12 sightseeing points. Horse are well behaved and safe, Just recommend not for people with heavy weight. Below is a map and some of the sightseeing and attraction points with distance from at Matheran Post Office area. 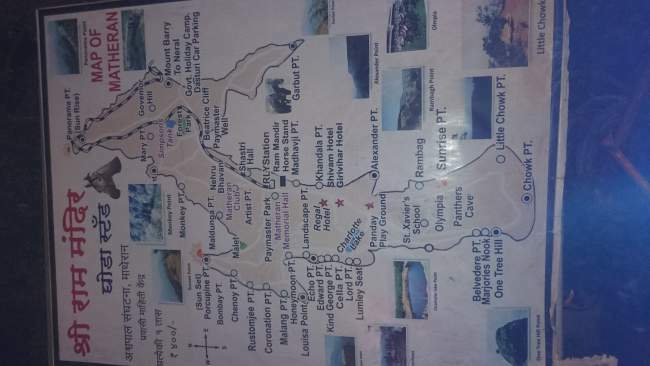 : Points Covered are Echo Point (3.20 Km), Landscape Point, Honeymoon Point (2.40 Km), Malang Point & Louiza Point (3.20 Km). : Attractions like Alexender Point (1.20 km), Rambaug Point (2 Km), Little Chowk Point (4 Km), Big Chowk, One Tree Hill Point (3.20 Km), Belveder Point, Marjories and Nook Point. : This Horse Ride tour will cover all 5 Points (as above) and Coronation Point, Rustamji Point, Chenoy Point, Maldunga Point, Porcupine Point, Malet Spring Point. : 4 Point which are ideal for sunrise are Panorama Point (5.20 Km), Rambaug Point Garbut Point (4.80 Km) and Porcupine Point. Alexander Point : For scenic and photo clicks, this is one of the best points covered in tourist spots listed, you can take a horse ride. Deep forest and other tourist spots can be seen from here. Charlotte Lake : This lake side point attracts major picnic groups as it has Echo and Louisa point. Charlotte is a peaceful and silent lake to enjoy birds. You need to walk through a dense forest for about 25 minutes from market location. This lake is also a source of drinking water for local residents. Hart Point : A ghat (valley) view showing greenery. It is said that the night view from hart point shows the lighted Mumbai city. Louisa Point : If you are photo lover and want some nice clicks, Louisa is the point to click waterfalls, group of birds, valley and some other points that can be seen from here. Shivaji Ladder, Cecil Point (Waterfall for monsoon), Panorama Point, Chowk Point, Rambagh point, Madhavji Garden, One tree hill point, Porcupine point and prabal fort. Since no vehicles are allowed, you can venture the mountains with options like horse ride, hand carts, or just walk around the mountains. I bet you will enjoy the stroll with sightseeing all around, enjoy golas (Flavoured ice candy), Chikki (Speciality of Matheran). Be aware of Monkeys, they are fearless fast and can dare grabbing you belongings in search of food, Particularly the plastic bags which they usually see people carrying food items and water. A simple walk along beautiful cottages and resorts and the woods near can make your day. These are beautiful cottage resorts, small village homes, muddy roads. Few of the most important reasons behind selecting this hills as picnic spot and attractions is that it is the most nearest hill station from Mumbai, One can reach via train and any private vehicle and can be back within a day, making it a real nice day to be with nature. Secondly, people in this polluted city needs break from all air and noise pollution, Location being Eco friendly with ZERO vehicle is the best to be. There are both budget and expensive hotels that charges about 1500 to 2000 Rupees (Per person) up to 3000 (per person) and more in peak season (Winter). To add on to the list of things to not miss if you are around May, Annual Green festival is organized which educates and brings up the value of going green via the awareness program. From growing green vegetables to building eco-friendly homes and lots more, ‘The New Bombay Design’ organization and Matheran Pratishthan organizes this 5 days around festive event took place this year 2015 and hope to reach another milestone every coming year. Emergency Contacts : Matheran Police Station Number : 02148-230300, Nagar Parishad (Municipal Corporation) : 02148-230234 / 02148-230343.